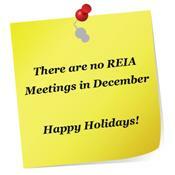 No matter what your real estate investing interests are there''s always something to do and plenty to learn at REIA! Learn from scratch or learn something new for your existing business, build your team with some of the best businesses and member benefits around and enjoy networking with "like minded" individuals and "investor friendly" businesses that is second to none! Volunteers are on their annual "break" from REIA meetings and classes and are updating the Calendar of Events now! Browse events in the coming months as they are added to the Calendar and visit the REIA Meetings & Classes page for more information in the interim. The REIA office will be open Monday through Friday on a limited basis during our "break" and can be reached at 425.454.1922 or 1.877.454.REIA (7342). We look forward to seeing you next in January 2019 and on the REIA Member Forum!